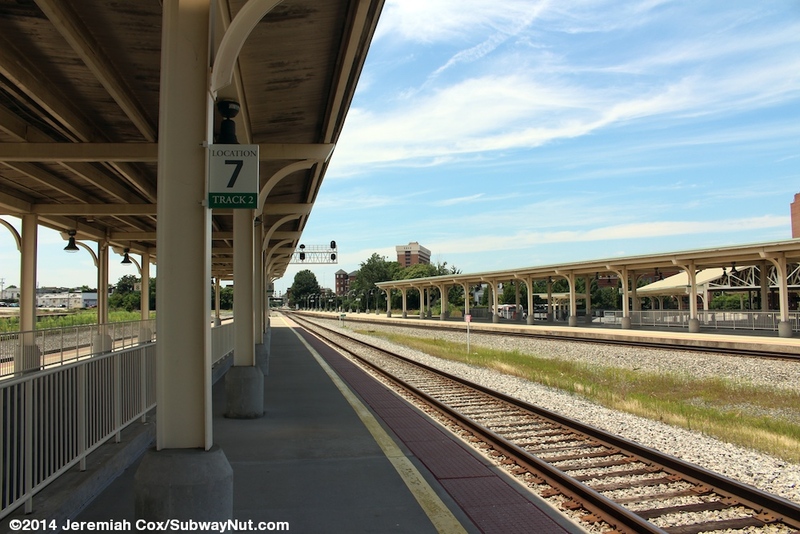 The City of Greensboro has received train service continuously since trains first arrived in about 1856. 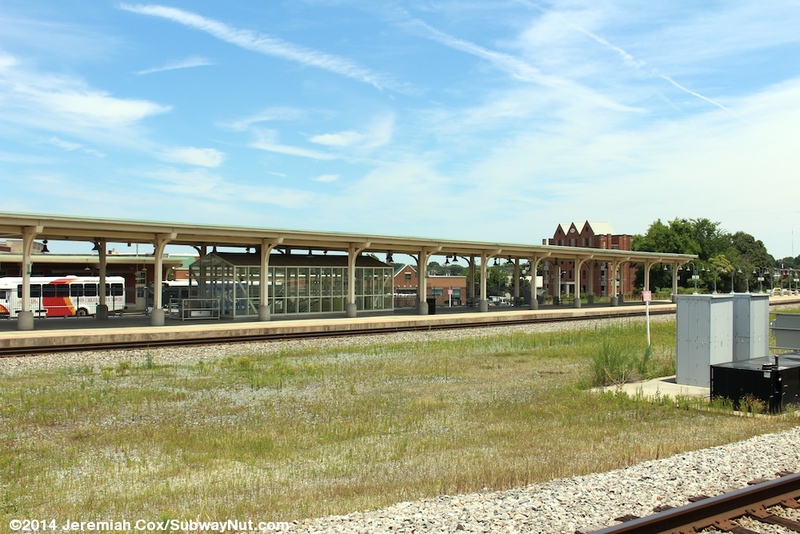 The Southern Railway didn't originally elect to join Amtrak and operated its Southern Crescent until February 1, 1979 when it applied to discontinue the route. 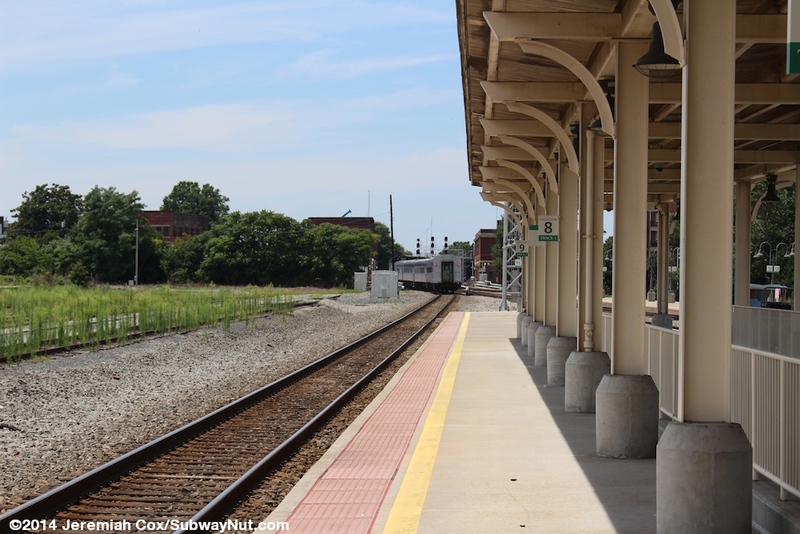 Amtrak took the service over renaming it Crescent, the train using the same route as today. Amtrak through-lined most of the cars of this train, operating it up the Northeast Corridor from Washington, DC to reach New York. Until 1976, the Piedmont, a day train on a different route than todays Piedmont between Atlanta (cut-back to Charlotte in 1975) and Washington, DC supplemented the overnight Crescent along the same route. 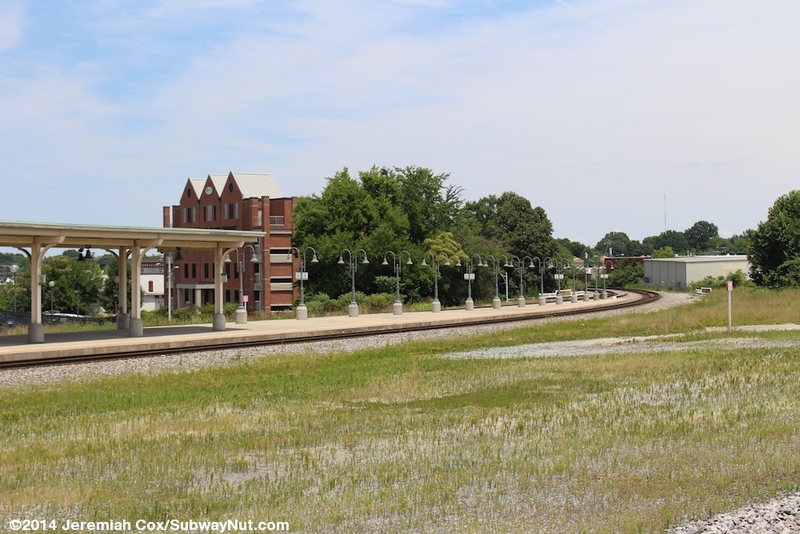 1979 was also a sad year in Greensboro because in May trains abandoned their historic 1927 brick station with its Beaux-Arts facade of columns and relocated to a building shared with freight trains on the edge of the main Greensboro freight yard. This building is located at 2603 Oakland Ave, 3 miles west of the historic station. The brick building is still standing today and is a non-descript brick building now totally turned over to freight crews. A tower is on top of the building for crew views of the surrounding train yards. Amtrak had a small waiting room in a building shared with freight crews. 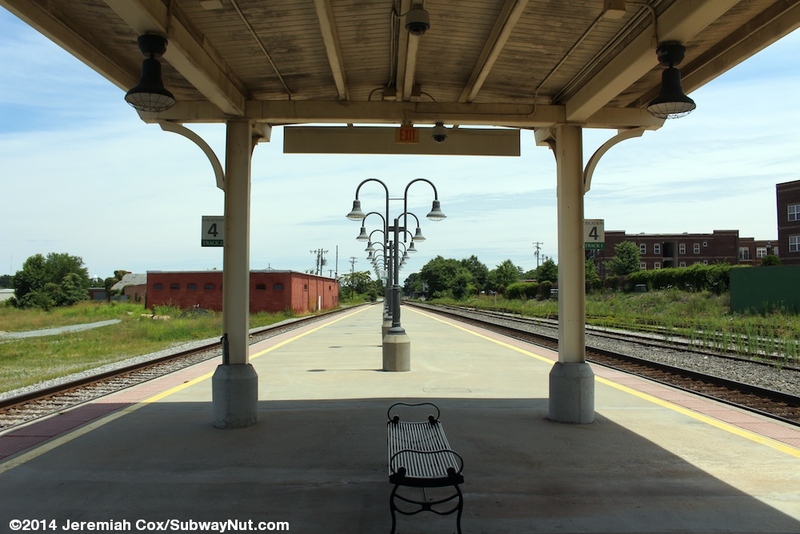 Amtrak's portion of the station had a tiny waiting area that must have gotten quite overcrowded USA Rail. 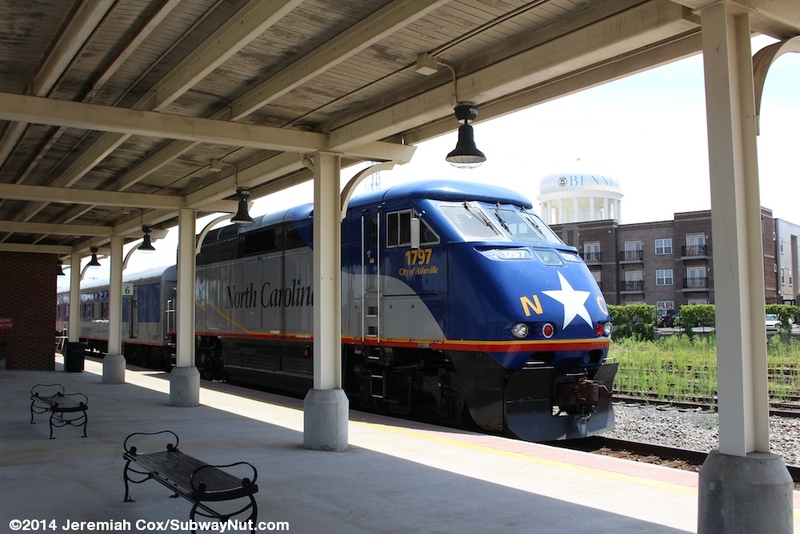 It was at this depot the state began sponsoring the Carolinian on May 12, 1990, running between Charlotte and New York via Raleigh and Richmond, restoring train service for the first time since the 1960s between Greensboro and Raleigh. 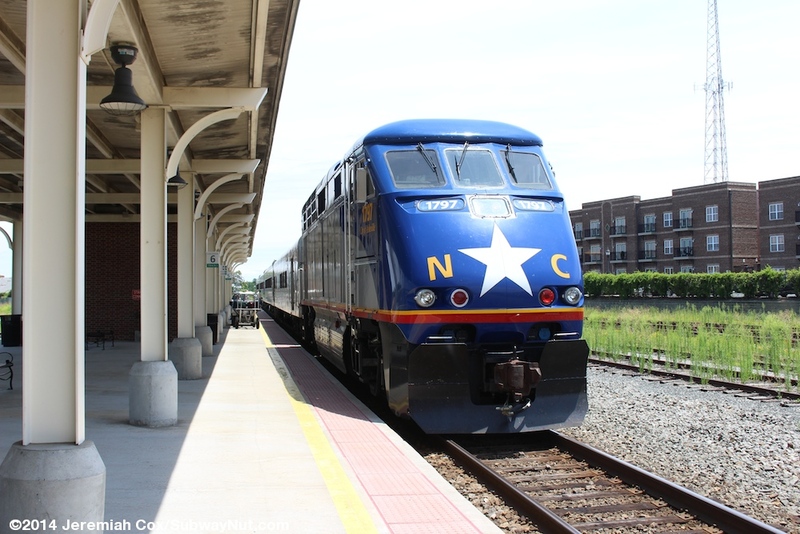 In 1995 the first state-owned (using equipment owned by the state) Piedmont began running on a slightly different route that it used 30 years early as a short train operated between Charlotte and Raleigh through Greensboro. 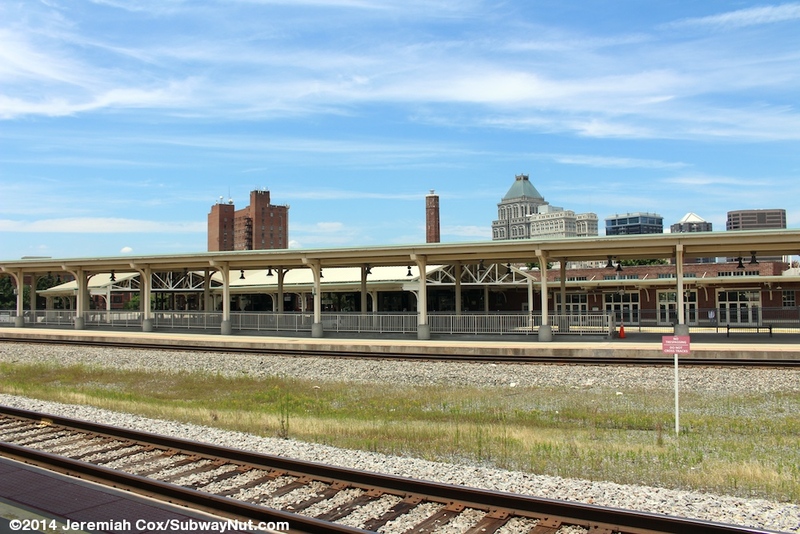 Starting in 2001 construction began turning the derelict depot into the J. Douglas Gaylon Depot, an intermodal transportation center servicing nearly all transit providers in Greensboro. The total costs were about $32 million The first phase was finished in 2003 and consisted of restoring the building including rebuilding the former upper level baggage handling areas into a waiting area for local Greensboro Transit Authority city buses and Piedmont Authority Regional Transit (PART) buses that connect the cities of the Piedmont Triad (with easy, fast and frequent hourly service with a bus change at a pulse point in the suburbs to High Point and Winston-Salem). 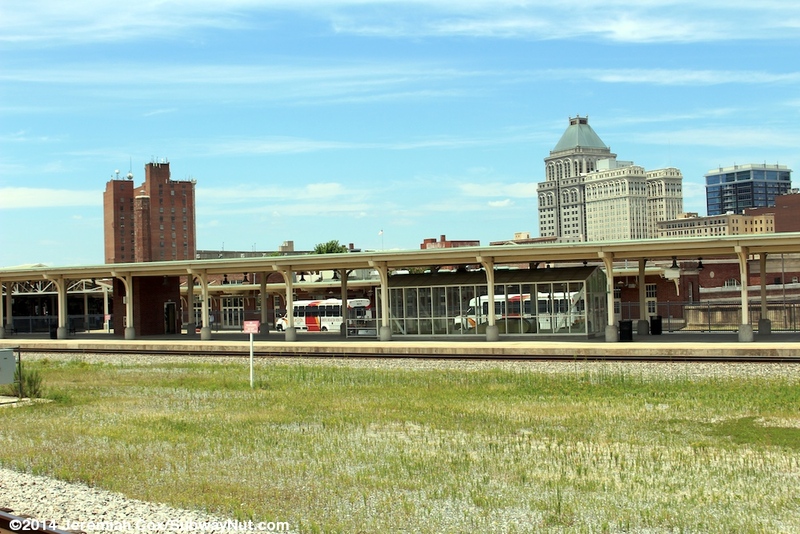 The nearby former Railway Express Agency became the Greyhound Station for Greensboro. 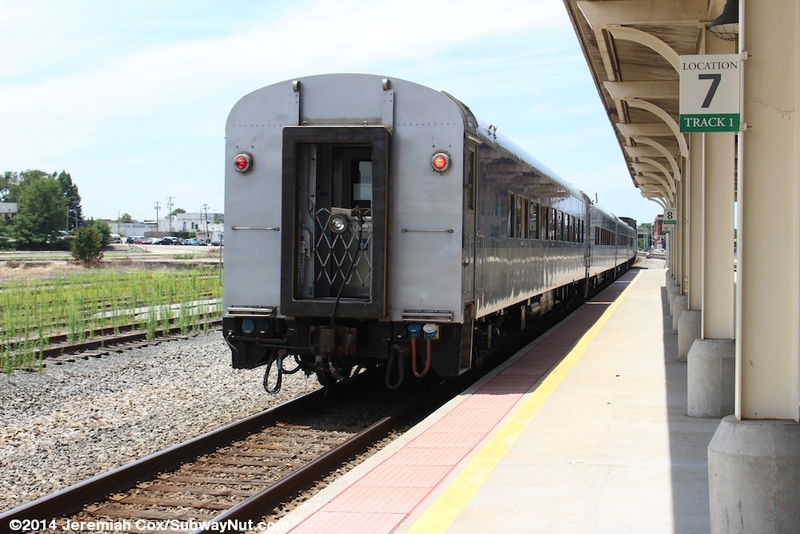 The second phase consisted of a slight realignment of the tracks, the restoration of the pedestrian tunnel to the tracks and the building of a new tunnel just for baggage carts into the station. 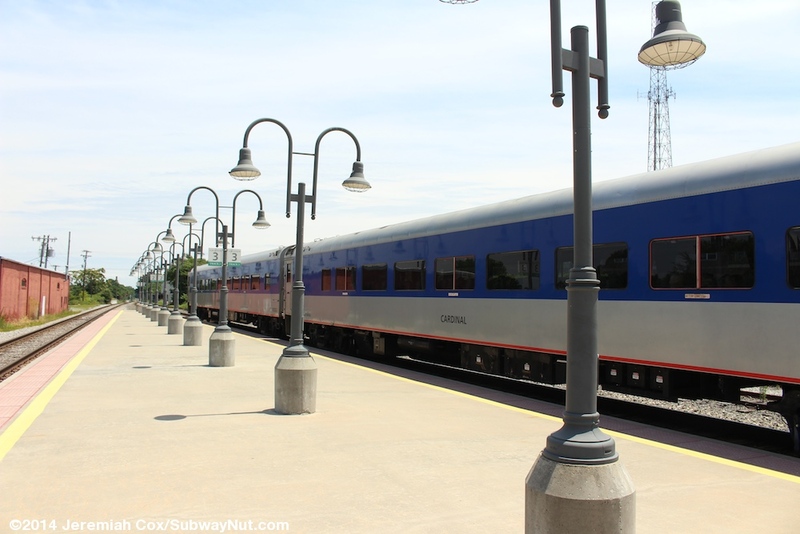 Amtrak service came full-circle and was restored to the depot on October 1, 2005. 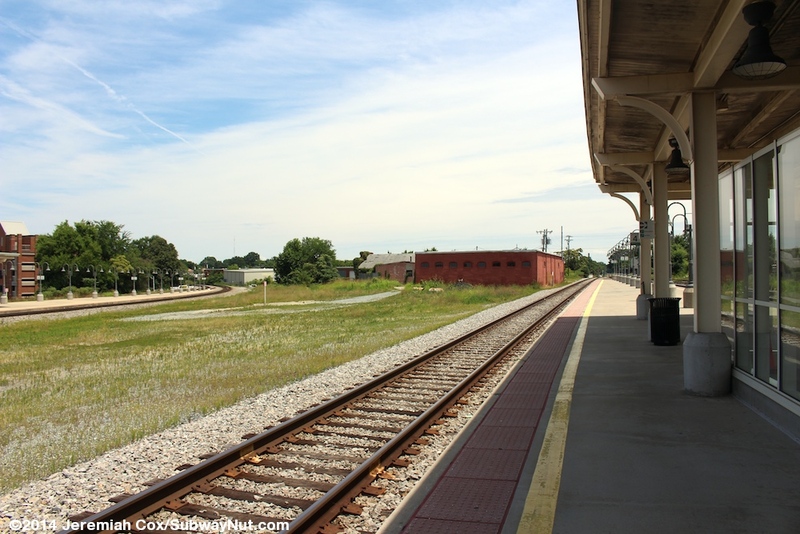 The station is located directly where the line used by the Crescent to head north up to Danville, Virginia diverges from the North Carolina Rail Road on the east-west route used by the Carolinian and Piedmont. The junction between the lines is west of the station so there are two island platforms each for two tracks with the north platform and one closest to the station used by the Crescent. The entrance to this platform inside the pedestrian tunnel has a number of Stop: This Platform is for Trains #19 and #20 only signs, and farther island platform (that has an identical design) south of here. 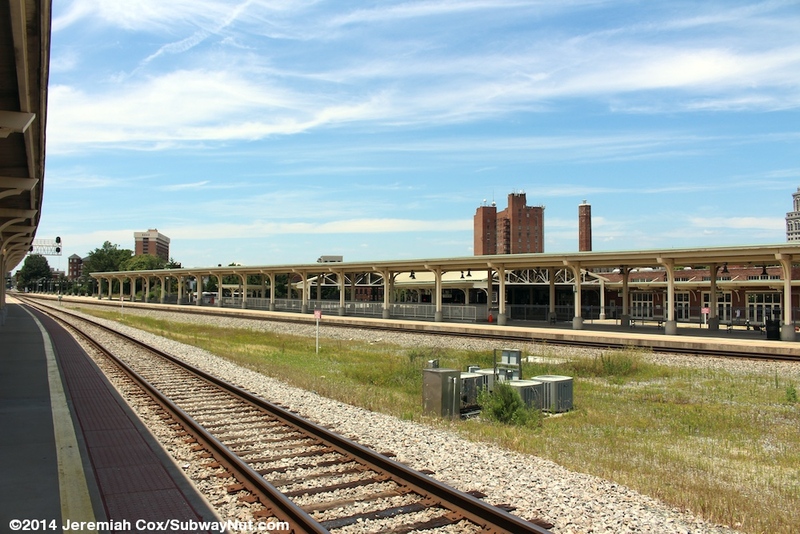 The platforms are also at different angles, together at their western ends with a building between them at their eastern ends as the Crescent curves north. 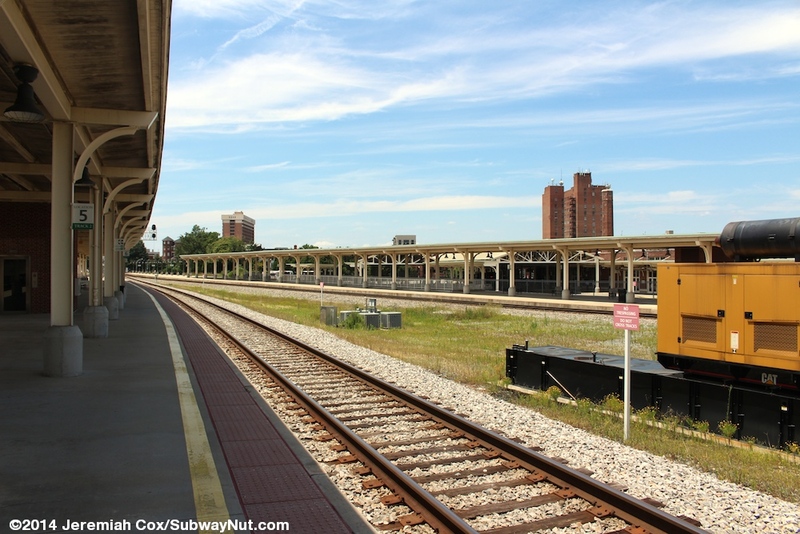 In length, the Crescent's platform 1 (for tracks 3 and 4) is longer at about 1,180 feet in length (over 13 cars) compared to 780 feet (about 9 cars) for Platform 2 used by Carolinian/Piedmonts (for tracks 1 and 2). Otherwise the platforms are identical except the Crescent also has a longer canopy at 600 feet versus 400 feet. The station platforms are on a bit of an embankment and are at the same level as the modern bus loops and former baggage buildings. Davie Street has an underpass just beyond the end of the station (after the middle two tracks switch and 4 junction into 3 at the end of the station platforms), but just a tiny distance beyond here Elm Street has a grade-crossing. The two island platforms each have tactile warning strips that are a pink color, grey lampposts along their exposed sections and a cream colored canopy structure around the middle of the platforms. For waiting passengers there are a few benches, although the tunnel to the platforms is kept locked by the station staff until train time. Ill-positioned Greensboro signs with black text in a serif font area at each end of the canopy. 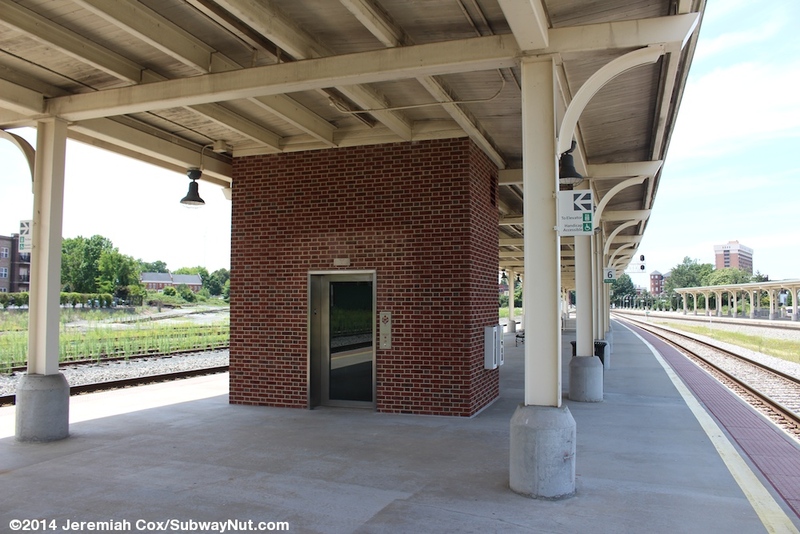 To leave the platform is a glass enclosed (with doors) staircase/up escalator, along with an elevator in a brick enclosure. These are almost in the middle of each platform. 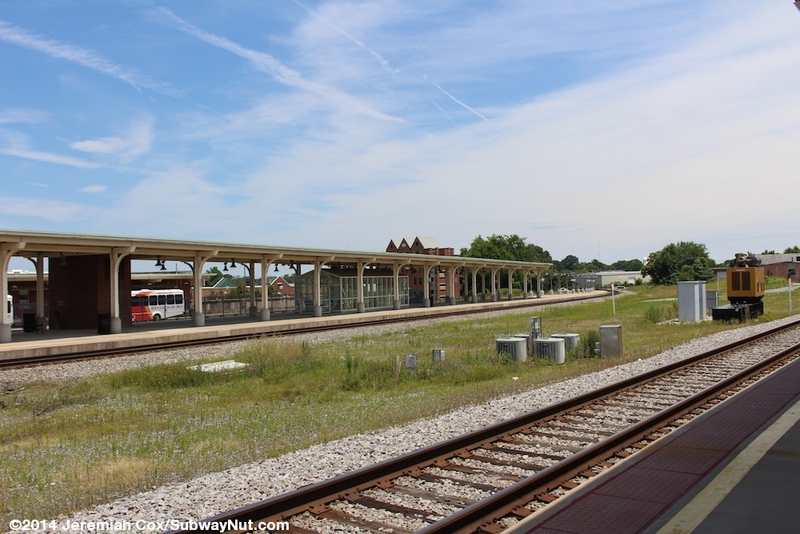 There is also a deeply sloping downward baggage ramp (with a Baggage Tunnel: Amtrak Personal Only sign) that starts at the western end of the platform canopies. For passengers these lead down to a pedestrian tunnel with the platforms each guarded by locked doors. These make the platforms open to ticketed passengers only. This tunnel has white walls and some built in wooden benches along the walls. These benches no one is really allowed to wait in since the doors at the entrance to the tunnel are kept locked until train time. 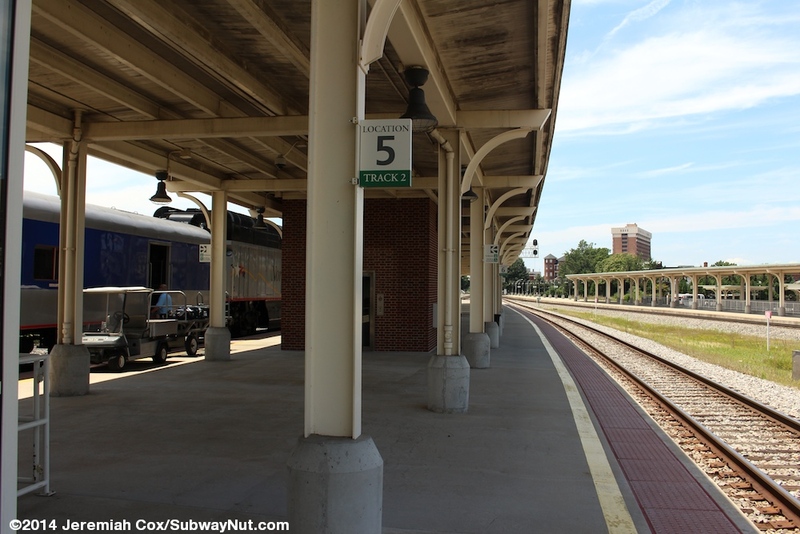 There are also plenty of both permanent and movable signs directing passengers to tracks 1 and 2 and labeling the platforms for the Crescent or Piedmont/Carolinian. Passengers eventually exit this tunnel at a set of glass double-doors in wooden frames above golden To Trains text. These doors are kept locked except when trains are announced for boarding and have a number of Ticketed Passengers Only sings. Passengers arrive into the station right near a brown door that says Baggage Room and is by the end of the baggage tunnel. At one side is access via stairs and an elevator up to the waiting room for PART and Greensboro Transit that is just above. 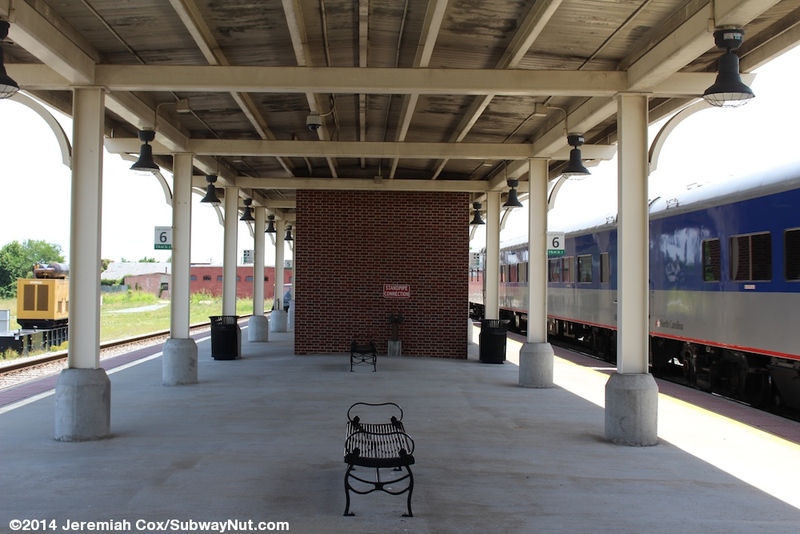 Passengers can also exit directly to the parking lots that surround the main waiting room of the station through two sets of doors that are exit only with entering passengers told to enter through the front of the depot. Straight ahead (and through more doors) is a jewel of a train station. In the center of this main waiting area is a higher ceilinged room. Above the doors out towards the pedestrian tunnel to trains is a restored map of the eastern seaboard and the Southern Railway System as it existed in 1924. The walls are white accented by marble. Dark wooden paneling is along many of the walls with gold text for various no-longer existent traveler services where they once were including The Union News Company, Baggage & Parcel Check, Station Master, and Bulletin, above a bulletin board box with an odd assortment of documents. A TV monitor built into the wall is the only place where information on Piedmont Trains is displayed electronically with real-time departures monitored and listed. Along the west side is the Amtrak ticket office with multiple window positions and usually multiple staff members working (including ones who make station announcements). The middle of the night stops of the Crescent make the station open for 24 hours a day. There is also a former Lunch Room that is now a convenience store. This makes Greensboro the only NC Amtrak station to have food service that isn't just vending machines (some vending machines are also along an appropriately labeled wall). The East side of this central area contains the station's waiting room. Wooden benches line the area. At each end are separate wooden telephone booths these have been restored but without telephones and signs say Cell Phones. The couple of remaining Pay Phones are still there but have been disconnected Pay Phones are no longer available in the station. By these phone booths is either the men's room and the other the women's room. There is space for a second restroom that a wall used to divide this waiting room into two to create separate rooms for Blacks and Whites during the eras of segregation, with separate facilities for the two races. When the station was restored post-segregation having two sets of restrooms was unnecessary and the restrooms were each enlarged to create a single larger restroom for each gender. Outside the station is equally impressive. Pillars line the exterior of the brick station with a main entrance with imposing marble columns forming a main covered entrance with Southern Railway engraved above. A small grassy plaza separates the main driveway (where taxis wait) from Washington Street at the foot of Church Street. On each side are small parking lots containing 100 parking spaces, Amtrak parking is free although a parking permit is required from a station agent. For bus passengers up above is a fairly nice bus loop. The two separate buildings, one for Greyhound and local bus services are nicely restored brick. The Greensboro Transit Authority/PART Building has a direct staircase/elevator down below. 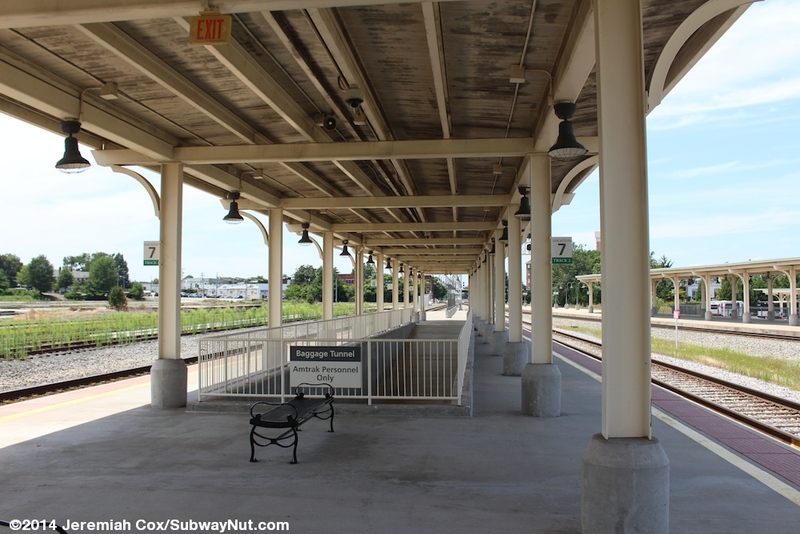 These lead out to a number of bus bays on three islands covered by canopy structures that are identical to the ones on the train platforms fitting in with the railroad theme of the station. Opposite the buildings are some pedestrian plazas, there are even a couple of 'pushcart permit spaces' and stairs, ramps and elevators gradually lead down off the higher embankment the station is on to the street grid below.